I heard from some body builders, that it is good to do a really hard work out for 10 minutes 4 times a day and rest every second day. That way you build up your metabolism and burn more calories. Walking doesn’t have much of an after-burn effect but some exercises do. 6 second bursts of cycling for 10 reps… That’s the type of exercise that burns fat and your body needs to recover from. 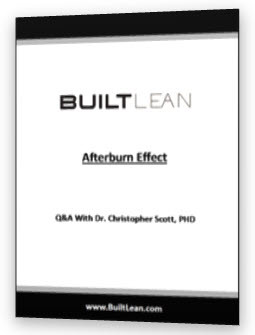 I have an interview below with Dr. Christopher Scott, PHD, who is an exercise physiology professor at the University of Southern Maine and one of the world’s foremost experts on the Afterburn Effect, which is calorie burn AFTER exercise. As you’ll learn in a moment, you can harness the power of the afterburn effect to burn more fat in MUCH less time working out. Surprisingly, very few people in the exercise physiology community and more generally in the fitness industry have acknowledged his pivotal research and its potential to change public health policy and your ability to burn more fat in less time. I was able to get Chris on the phone and record a 40 minute conversation with him. You can play the audio of our conversation below, download the 20-Page transcript, or view the summary and highlights I put together below. Energy expenditure refers to the amount of energy a person uses during all bodily activities from movement, to blood circulation, to breathing, to digestion. Energy Expenditure is measured in calories, a unit of heat, and is represented by the symbol kcal. What is Aerobic vs. Anaerobic Exercise? Aerobic exercise is a type of activity marked by long distances and slow paces like running, or cycling. Anaerobic exercise is marked by activities that require strength, speed, and power like weight lifting, or sprinting. 1) Calories Burned During Exercise (O2) – Oxygen uptake is proportional to heat expenditure during normal aerobic exercise. For this reason, calorie burn during aerobic exercise is easy to estimate using a metabolic cart. 2) Calories Burned From Exercise (EPOC) – At higher exercise intensities, oxygen uptake is NOT proportional to heat expenditure. An oxygen debt is created, where EPOC (excess post-exercise oxygen consumption) is used to help restore the body to a resting state and adapt it to the exercise just performed, which requires energy. 3) Lactic Acid Contribution of Exercise – EPOC is NOT enough to fully account for anaerobic contribution of exercise to total energy expenditure. This is a VERY important point and what differentiates Chris’ research. Chris has proposed that by measuring blood lactate reasonable estimates of rapid glycolitic ATP turnover are available and should not be omitted from the estimation of energy expenditure from anaerobic exercise, especially when anaerobic contributions are large. Energy Expenditure component #2 is typically referred to as the “Afterburn Effect”, when it should really be #2 and #3. The afterburn effect is minimal for traditional cardio, but can be significant for strength and power related activities. In his first major study, Chris proposed that as much as 95% of the calorie cost of intense anaerobic exercise can come AFTER exercise! While Chris says the numbers are not perfect estimates and were used to help highlight the importance of anaerobic contribution to exercise, they are still revealing. While Chris did not separate out the effects of Hypertrophy as a possible 4th component, he did note that it does require energy and that it’s not being estimated/measured. “There was a study I saw years ago, and I still quote it, and they were doing these six-second bursts of all-out cycling. It was 10, 15 sets of this, and they found this unheard of amount of free fatty acids that were broken down from fat stores within the muscle. It begs the question why, during an anaerobic activity that clearly utilizes glucose as a fuel, why is so much fat being broken down? The answer appears to be, well, the exercise component is six seconds long, and that’s using glucose, but however long the recovery component is, that’s when you’re burning fat. If you add all these intermittent periods together…you’re primarily burning lactate and fatty acids, and that’s where the body composition stuff comes in. “We have a long way to go before we understand this, and that there are times when it’s almost – for me, from a scientific standpoint – it’s almost overwhelming because we’re finding out that isotonic contractions are different than isometric, that are different from isokinetic. Then you add different one repetition maximums or ten repetition maximum, how much exercise time’s involved, number of reps, the number of sets, the number of rest periods in between sets. We have a long way to go before we find the perfect exercise program, if you will. The truth of the matter is there’s probably not one perfect program. There’s probably dozens of perfect programs. Again, it all goes down to the independence of the person that’s involved. What’s actually best for them? 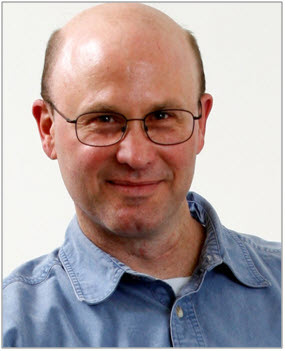 Dr Christopher Scott is an Associate Professor at the University of Southern Maine. 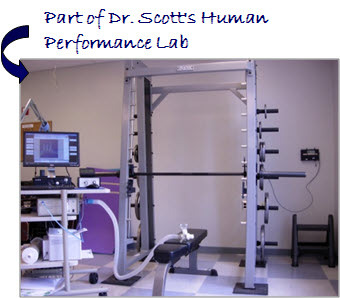 Dr. Scott has been called a “pioneer” for his research. Focusing on the determination of energy expenditure for strength, speed, and power related activities, both during and after exercise. He has been a professor of exercise physiology for 9 years and is the sole author of the 5-star ranked textbook “A Primer for the Exercise and Nutrition Sciences: Thermodynamics, Bioenergetics, Metabolism”. For a longer bio, Curriculaem Vitae, and Publications, you can visit Dr. Scott’s website.